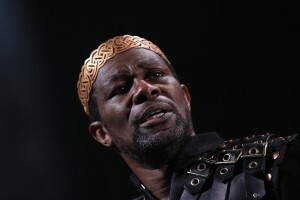 John Douglas Thompson in Macbeth. Photo by Gerry Goodstein. This April, as part of the Theatre’s education program in NYC Public Schools, actor John Douglas Thompson visited 10th-grade students at Morris Academy of Collaborative Studies in The Bronx. The school’s principal, Charles Osewalt, took Thompson on a tour of the historic Morris High School building, ending in the building’s auditorium where the students were waiting. The students had attended a matinee performance of Macbeth prior to Mr. Thompson’s visit and were prepared with questions about the play, the character of Macbeth, and Thompson’s acting preparation and career path. Following questions and answers, students read their own reviews of the production, and Mr. Thompson performed scenes from the play with the students. Guided by the Theatre’s master teaching artist Erin McCready and their classroom teacher Ms. Clendenny, the students will continue to examine the play by reading the text, using its major themes to inspire creative writing, and finally creating their own performance of Macbeth with their own writing interspersed with Shakespeare’s text.